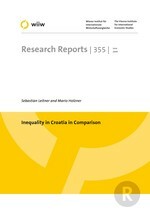 The paper analyses economic inequality in Croatia in comparison with other transition economies of Central, East and Southeast Europe. It comprises a literature review and a descriptive analysis as well as an econometric modelling exercise. The main findings are the following: Over the entire transition period, Croatia has had a rather low and remarkably stable level of income inequality. The decomposition analysis of the period 2000-2006 shows that, although the concentration of income from paid employment was rising, overall stability of income inequality was due to a reduction of the more unequally distributed income from self-employment as well as to improved targeting of public transfers in later years. By contrast, the redistributive effect of the system of public pensions is rather low and could be improved. The outcome of the econometric analysis suggests that Croatia should further aim for a high share of government expenditures and a low level of inflation, in order to achieve a reasonable redistribution of disposable income and a stable development of real income. At the same time Croatia should increase its share of exports of goods and services in GDP to raise employment in the more productive export industries. Efforts to further decrease the relatively high unemployment rate would yield positive distributional effects as well.